So it’s been a busy ol’ time as of late, playing a little bit of hopscotch with photographic assignments in Asia and within Japan. 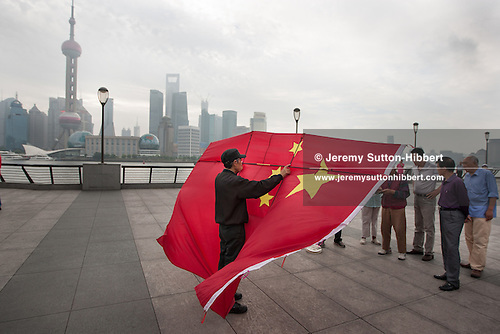 Chinese flag kite on the Bund, Shanghai, China, 2012. ©Jeremy Sutton-Hibbert 2012, all rights reserved. Since the China trip there has been a lot to take care of, a lot of editing for the show and selection for the client, and other photographic assignments here in Japan, up to Kawamata near Fukushima for a magazine story about a silk factory, and down to Osaka also for two other magazine pieces. But perhaps more on them tomorrow, or a later date.